How did I miss this series?? I totally blame Carmel at Rabid Reads. She doesn't know it, but it's her job to steer me towards new series. Just kidding, Carmel. What I liked: I was very surprised to get hooked so quickly. Usually I cut the first book in a series a bit of slack because it has such a tough job. Grab your attention, keep your attention while building the world of the characters. Of course, the characters have to be developed enough to give you an idea of what to expect without giving out too much information. So, overall, a first book in a series, has to be well balanced. 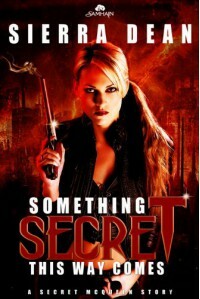 Something Secret This Way Comes exceeded all my expectations. Ms Dean does an excellent job of getting you hooked in a short amount of time. I found the book to be a quick read even for me. Even while reading so fast, I didn't get lost with who was who. That's also a key in my book. You can have lots of characters but the author needs to make each one memorable. I loved the portrayal of Secret McQueen, even the "funny" first name made sense and Ms Dean played on the character's name throughout the story. (Maybe a bit too much for some readers). Secret's job, while not totally unique is just different enough to keep the reader guessing. She's a killer but not indiscriminately. The Vampire Council orders the kills and there needs to be a reason for the kill. It can't be a willy-nilly reason either. It's almost like the Council weighs and measures each action before it acts. I liked that part. Most Urban Fantasy books include shifters and vampires but in Secret's character, we get a rare combination. She's half vampire and half werewolf. She embraces her vampire half but tries to completely ignore her wolf. Well, until this latest case anyway; her wolf is more than making herself known. The wolf decides Secret is mated not to one, but to two werewolves. To make it even more interesting, the mates are Lucas Rain, King of the East Coast werewolves and the other is Rain's second in command, Desmond. While this whole soul mate situation throws Secret off her game, Lucas and Desmond seem fine with it. I'm not sure how this is going to play out but I feel as if Lucas has plans for Secret that she has no idea about. (Just guessing here). Ms Dean wastes no time in getting Secret and Desmond in bed but Lucas is more controlled (controlling?) with the mate bond. What I didn't like: So you can tell by my long winded "likes" that I really enjoyed this book. I did find myself worried a bit about Secret's age but Ms Dean handled it very well. I thought Secret might be too young for the character but I was wrong. Also, I'm one of those who thought the jokes about Secret's name were a bit over done. The ending of Something Secret This Way Comes completely floored me and I immediately bought the next in the series which I'm trying desperately to fit into my reading/reviewing schedule!